The hippest, coolest film of the decade! ChungKing Express is an arthouse film from the island of HK, directed by New Wave director Wong Ka Wai. ChungKing Express is a modern love tale setted in the contemporary scenes of HK, telling two stories of two night-beat cops. "Shifting wildly from manic noir to absurdist comedy, the film offers a magical mystery tour through the most cosmopolitan city on earth, telling parallel stories of two Hong Kong cops who are dumped by their girlfriends." It's more of a movie showing us the modern, fast-paced HK life. In Wong Ka Wai's words, "I am trying to tell two independent stories in this film. 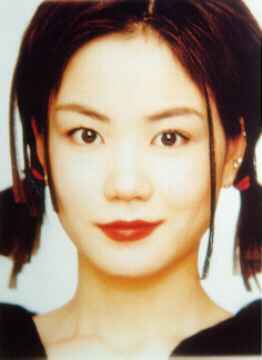 The first story involves Lin Chin Hsia and Takeshi Kaneshiro and takes place in Chungking Mansion; the second involves Faye Wong and Valerie Chow and happens in Central. I have quite a few stories that I wantedto film but never got round to. And there are two places that particularly intrigued me. One: Tsim Sha Tsui. I grew up in that area and I have a lot of feelings about it. It's an area where the Chinese literally brush shoulders with westerners, and is uniquely Hong Kong. Inside Chungking Mansion you can run into people of all races and nationalities: Chinese, white people, black people, Indian. And two: the escalator from Central to the Mid-levels. That interests me because no one has made a movie there. When we were scouting for locations we found the light there entirely approporate. "Like I say, the two stories are quite independent. What puts them together is that they are both love stories. I think a lot of city people have a lotof emotions but sometimes they can't find the people to express them to. That's something the characters in the film share. Tony talks to a bar of soap; Faye steals into Tony's home and gets satisfaction from arranging other people's stuff; and Takeshi has his pineapples. They all project their emotions on certain objects. Only the Lin Chin Hsia characer does not have any emotions. She has to keep working. To her, survival is moreimportant that emotions. She's like an animal, roving in Chungking Mansion like it was a jungle [the literal traslation of the film's original title is Chungking Jungle]. This movie has won numerous awards from all over the world. Recently, TIME magazine, in it's Top 10 movies of the year, named ChungKing Express as number 3. The movie has also brought its stars a lot of praise and awards. The first story tells, or rather the cop, played by Takeshi, Cop 223, tells us that he has just broken up with his girlfriend and gives himself 30 days to find him another girl...using the due date on the pinapple cans as a way of counting down. Cop 223 meets a mysterious woman(Brigette) who deals with drugs. The film than switches to the second story, the story of interest here as far as this page is concern because its all about af Faye! The second story stars my Faye Faye, Valerie Chow, and Tony Leung. In the movie, Faye works at a fast-food bar called Midnight Express. Faye is very down-to-earth and cute in the movie, very much like her shy self in real life, and always listening to the Mamas and Papas "California Dreaming." Cop 223 actually has an eye for Faye, but Faye only conerns herself with Cop 633, a regular costumer at the fast-food place too. But Cop 633 hardly notices ah Faye, because he has a girlfriend(Valerie), who's a flight attendant. Because she travels a lot, so she parts way with Cop 633. Before Valerie lefts, she drops the key at Midnight Express for Cop 633 to pick up. The key ends up at Faye's hands, so she secretly goes to Cop 633's apartment and clean, decorate, and even change labels on his can foods, while "California Dreams" is always playing. On one occasion, while Faye was cleaning at his apartment, Tony comes home and thought his former girlfriend came home and tried to find her(thought she was hiding in the house.) Faye got away without him seeing after a few change of hiding places...the movie let's us know the beauty of the city, but artificial beauty cannot replace the relationships of people interacting together. Faye was lonely in the movie...she needed someone to share and do things together. So naturally, the cleaning of Tony's apartment was sort of an answer and an escape for Faye. If you are one of the few who has yet to watch this amazing film...go out and rent it! The playfulness of Faye's presents is so refleshing and fun to watch. As Roger Ebert of Chicago Tribute wrote: "Both of these stories, about disconnections, loneliness and being alone in the vast city, are photographed in the style of a music video. What happens to the character is not really the point; the movie is about their journeys, not their destinations. There is the possibility that they have all been driven to desperation, if not the edge of madness, by the artificial lives they lead, in which all authentic experience seems at one remove." So take the journey...experience ChungKing Express..the hippest, coolest movie of the decade!